I’m back to finding alternatives to the use of Java. Oracle is working to increase license collections on Java big time starting this year. I loath Oracle and all things Oracle, and the fact they now own Java and have gone after licensing fees for Java means, for me, that I have come to loath Java equally. It is for this reason I’ve once again flip-flopped toward finding and using any and all alternatives to Java on every platform I work with. 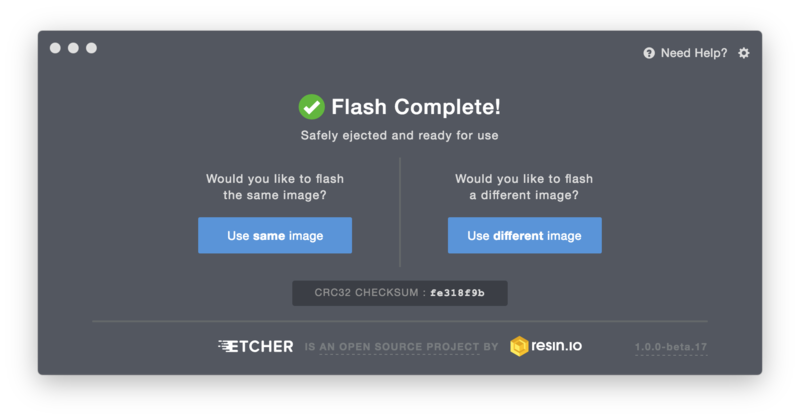 An excellent example of an alternative is the image burner application Etcher from resin.io. It can safely copy a Linux image from an image file (iso, img, etc) to a USB drive or SDHC device. It can work on Windows, Linux, or macOS. In this example I tested it on macOS Sierra. It’s open source and available via github. 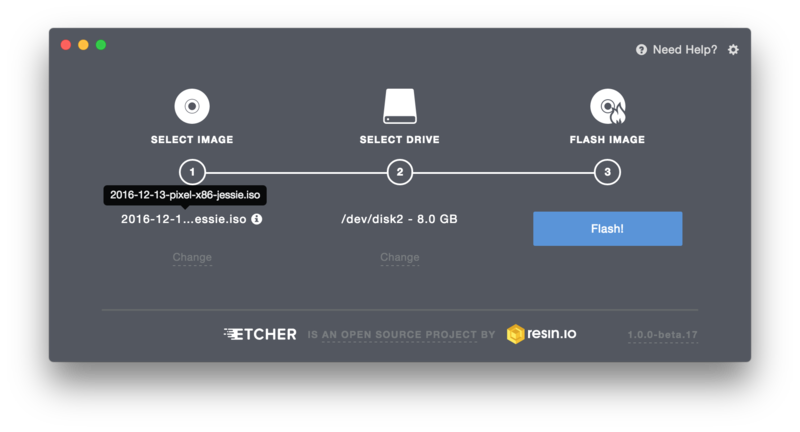 I can use it to copy my Raspberry Pi images to micro SDHC cards simply and reliably on my MBP. That last bullet is what makes it a full keeper for me, as well as the tool I now point novices towards who want to work with the Raspberry Pi and want to create their own micro SDHC cards. It is absolutely as simple as starting the application, pointing it towards the image, and then plugging in the device to be flashed. 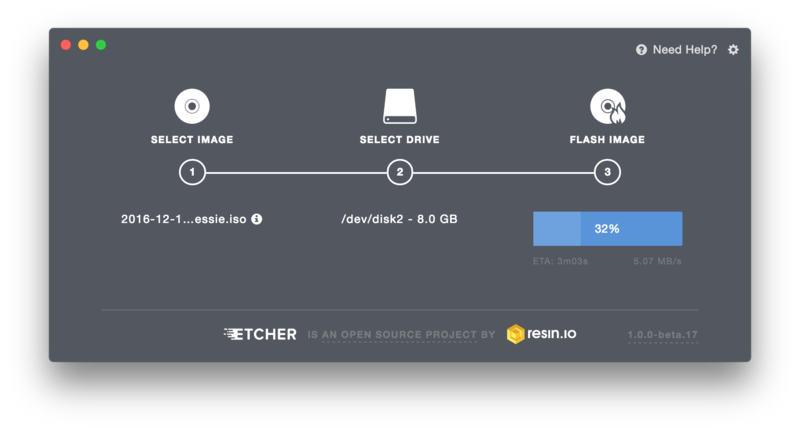 Etcher finds the device automatically, making it dead simple to click the button and start the image copy to the device. No more tricky and down-right dangerous CLI dances with mount, umount, and dd. Other Electron-based applications I now use are Atom, the editor, and Slack. There’s a whole bunch more out there, and the tooling to write even more is available where-ever there’s tooling for writing web applications. Java isn’t going to die anytime soon as it has a lock on a lot of legacy software. But that’s the same formidable block that Microsoft Windows posed back in the day, and we’ve seen where Microsoft is today, especially in mobile. Rather than complain about how bad Oracle and Java have become, my energy would be better spent promoting Electron and other foundational products and tools as better solutions than Java, even Java 8. It really is time to move on. The internet all too often serves as a huge amplifier of negative criticism. So-called social media influencers will decide, for whatever reason, that ‘X’ is bad for ‘Y’ reasons, at which point their followers (human and bot) mindlessly echo and amplify the influencers’ bad review. To make matters worse one influencer will influence other influencers, sending out negative reviews like a rapid rolling contagion across the web (the piling on effect). I’m seeing it happening in real time to Apple (“Apple is boring now; Apple has forgotten simplicity; etc”). I’ve seen this happen to too many good products, one of which is Firefox. The problem with Firefox is that this kind of mindless criticism has adversely affected Firefox usage across the web, driving down its overall usage numbers. 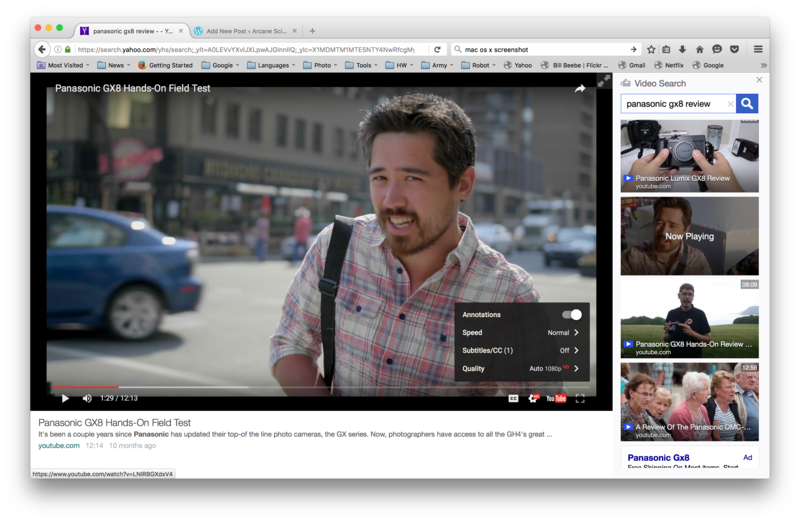 Being contrarian I decided to download Firefox 46.0.1 and give it a whirl on my MPB. The application is extremely easy to download and install on the Mac. 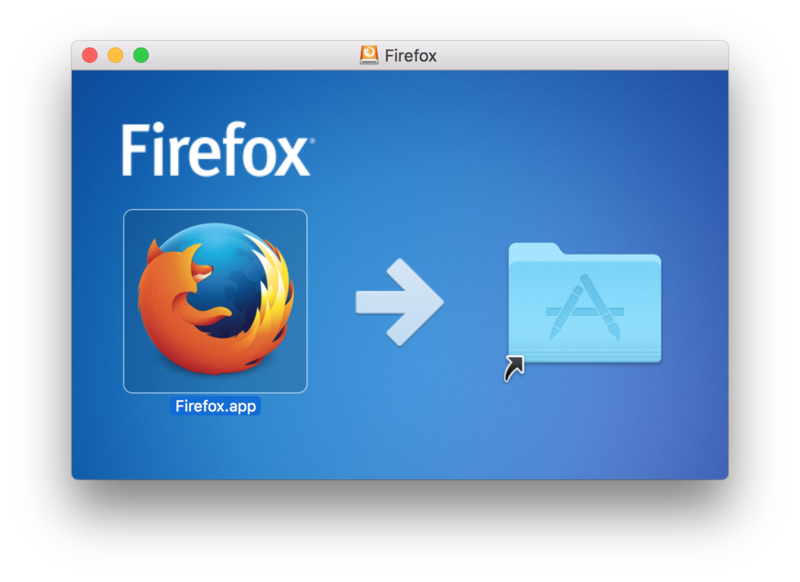 Once downloaded, you single click the Download folder in the Doc, single click the DMG file to start the load, and then just drag and drop the Firefox app into the App folder. Extremely simple, foolproof, with just enough control to let you make that final installation decision. Once “installed” Firefox starts up like any modern browser should on this platform and goes to work. During first time startup Firefox will ask if you want it to import other browser’s data it finds on your system. It asked me about Safari and Chrome, but interestingly enough, not Vivaldi. I chose to have it import all my Chrome links and data. It was supposed to also import my login passwords that I have for certain sites, but I went to one (my WordPress blog) and I still had to log in with username and password. Not such a big deal, but it’s interesting none-the-less. Operationally it’s as fast and smooth as you’d like, and no different than any of the other browsers I currently run on my MBP. I will say that the MBP I own is a mid-2015 15 inch with a 2.8 GHz i7, 16GB of DRAM, and a 1TB SSD. On this platform nothing is truly slow. But it is nice to see applications that are designed and compiled to be as performant as reasonably possible. That’s what I find with the current Firefox, a reasonably performant web browser, on par with Vivaldi, and faster than Chrome. Second, there’s Mozilla. They’ve long been developing Servo as a research browser engine in Rust, but their first production Rust code shipped through a different vehicle: Firefox. In Firefox 45, without any fanfare, Rust code for mp4 metadata parsing went out to OSX and 64-bit Linux users; it will hit Windows in version 48. The code is currently running in test mode, with its results compared against the legacy C++ library: 100% correctness on 1 billion reported executions. But this code is just the tip of the iceberg: after laying a lot of groundwork for Rust integration, Firefox is poised to bring in significant amounts of new Rust code, including components from Servo—and not just in test mode. I have a personal interest in both Rust and Google’s Go language, as well as a renewed interesting in C++ via C++11 and C++14 standards. The fight between greedy Oracle and Alphabet/Google over the use of Java in Android has finally pushed me off my metaphysical rear to find, and use, anything but Java. We were warned about the non-free nature of Java over a decade-and-a-half ago, and I chose to shrug it off. Now I’m promoting every language alternative to Java I can comfortably support, as well as the product built with these languages. If you want to change the status quo for the better then you have to support that change every way you can. Installing, running, and writing about this new Firefox is an important part of that. I’m not the only one intrigued by the latest Firefox. Infoworld has an article titled “10 things we love about the new Firefox browser.” I don’t normally promote any of the so-called technology blogs, but this one caught my eye because it’s on these tech blogs you used to find reasons not to use Firefox. It’s tough to provide a deep review of any software product after its immediate installation. This is going to have to be one of those long-term intermittent style reviews of the browser. It’ll be interesting, as it appears on first blush that Vivaldi and Firefox are the two most competitive browsers on my MBP at the moment, with me spending the lion’s share of browser use on Vivaldi. The browser is still a vital part of the web, and the pace of development in this area seems to stepped up rather nicely. I’m willing to support that effort, at the very least by using and testing. Here’s to Firefox’s continued successful development going forward.